Whilst on holiday in Devon, Barbara and myself called at the South Devon Railway workshops to find the first pair of wheels are being prepared for crank pin work. (See photos). Machining of the first driving wheel axlebox is well advanced although there is more to be done plus welding the manganese liners into place and whitemetalling etc. 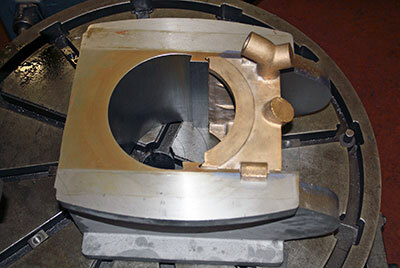 The bronze bearing is also being machined preparatory to being pressed into the crown of the axlebox. This is very time consuming work and is keeping team 82045 fully occupied. Springs have been ordered for the driving wheels. A couple of these have been sponsored by a generous supporter and as Chris mentions we will be delighted to hear from anyone with a similar desire. Riveting of the rear half of the chassis has progressed well and has reached the rear buffer beam area and will be moving on to riveting the spring brackets into place. Our draw will take place at the Peep Behind the Scenes event on 19th July 2014 at the Severn Valley Railway. Barbara has some tickets available at £1 each (£5 per book). First prize this year is two standard class tickets for a mainline steam trip of the winners choice and a SVR footplate ride awaits the second prize winner. Please contact Barbara if you wish to purchase. There has been an excellent response to the launch of Phase One of the appeal in the Spring issue of "SVR News", with funds continuing to arrive regularly on Barbara's desk. Thank you so much to all of you who have contributed so far, and to those who haven't yet done so, please do consider helping the boiler appeal on its way. We know that we face a big challenge in raising the money for this, the most expensive item of the new build loco, but all the signs are that the appeal will be as big a success as was the wheel appeal. We are reluctant to publish too many details of our funds, but please give Chris a ring if you would like an up-to-date assessment. Shortly after you read this, those of you who take "Railway Magazine" will find that the June issue contains a full-length feature article on 82045 and the Riddles Class 3 tanks, plus (please God!) a boiler appeal leaflet. The reason for the fervent prayer was a real nail biter of an almost-missed deadline for receipt of magazine inserts, caused by the courier originally engaged to transport the boxes of leaflets to the distributor. 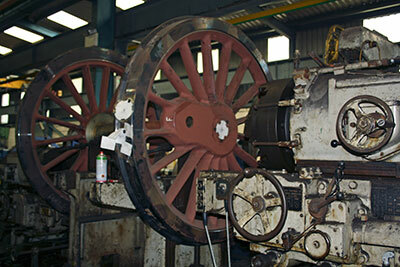 Please keep your fingers crossed for the success of this, Phase Two of the boiler appeal. We're very pleased with the article, though, and hope that you will be, too. Many thanks to Railway Magazine Editor Nick Pigott for doing a lovely job for us. Details of Phase Three of the appeal will be published at an appropriate date. Member John Fancote of Harborne, Birmingham, came forward immediately after publication of the April updates with an offer to sponsor the fourth pony wheel. Tony has issued the contract to have the pony wheels cast at Boro' Foundry, so very many thanks, John! Further items for sponsorship will be highlighted month by month. We would be very grateful for further offers to sponsor the driving wheel springs: the two spares have been sponsored, thanks to the person concerned and further details to follow. Each spring costs £1,055, so £1,000 with Gift Aid added would handsomely cover one, with money to spare towards a second. Springs are relatively unexciting and unobtrusive items, but absolutely essential for the wheeling of 82045 which we hope will take place later this year. Please have a word with Chris if you think you can help. The weekend of 16th/17th August sees the most unusual event yet in the history of the 82045 project....a sponsored parachute jump to raise funds for the boiler. The jump will take place 15,000 feet (argh!!) above, of all places, Swindon, and will be undertaken by intrepid SVR fitters Will Marsh and Gary Williams. Further details, including details of how to contribute, will be given in the June updates, so watch this space. An initial thought is to sponsor, say, £1 for every 1,000 feet of their sickening earthward plunge. More of this next month, but please don't hesitate if you'd like to get in quickly with your sponsorship. Cheques should be made out to the 82045 Steam Locomotive Trust, marked Parachute Jump on the back and sent to Barbara. Thanks in advance - and thanks especially to Gary and Will for this tremendous gesture. Makes me feel queasy just thinking about it! 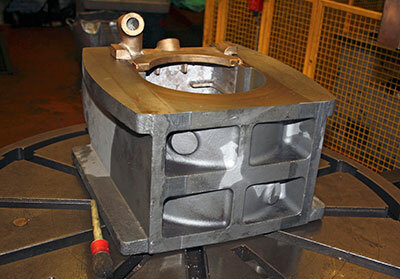 Two photos showing the first axlebox at a fairly advanced stage of machining, more work to be done though. 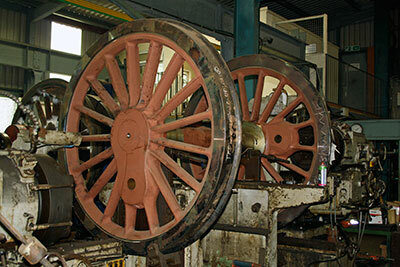 A pair of driving wheels preparatory to boring out of the crank pin holes in the workshop at Buckfastleigh.